We just received a new shipment of our favorite Czech matte glass beads in the ten colors shown above plus black. All are now available in strings of 20 beads. 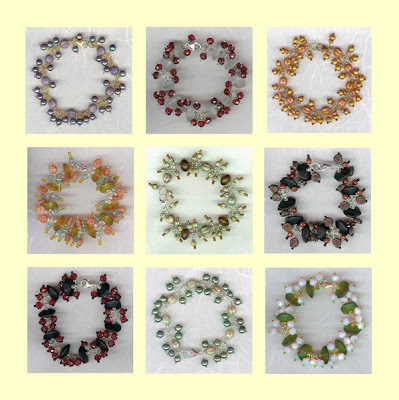 Look for your favorite color in Anita's Daily Bracelets and Daily Bracelet kits offered at Anita's Beads. Limited edition Daily Bracelet kits are now available in both sterling silver and gold-filled. Anita will be giving free "counter classes" in wire bracelet construction through the month of October. I'm four days ahead on my daily bracelet project at http://dailybracelet.blogspot.com. 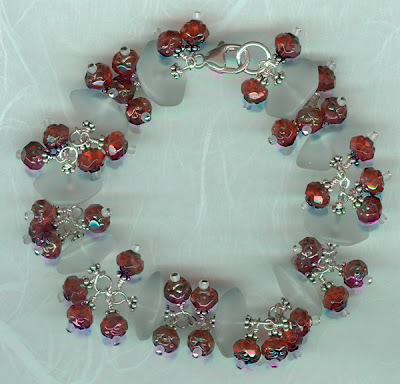 The latest design uses the matte crystal Czech glass baroque beads that I love so much along with siam ruby rosebuds for a holiday look. The metal is sterling silver throughout. I've been trying to get a decent picture off the scanner but there is too much traffic right now and the vibration is causing colored shadows. Interesting effect but I could do without it.